After days of searching, you’ve found the one—a dream job with great benefits, a schedule that makes sense, and responsibilities you can be proud of. All you need to do is just start writing a resume. And here you are - still staring at the blinking cursor on your screen, unable to take that first step. Questions start rushing in. How do you start a resume? What are some great resume openers? Your resume should always begin with the title resume at the top - true or false? Relax. 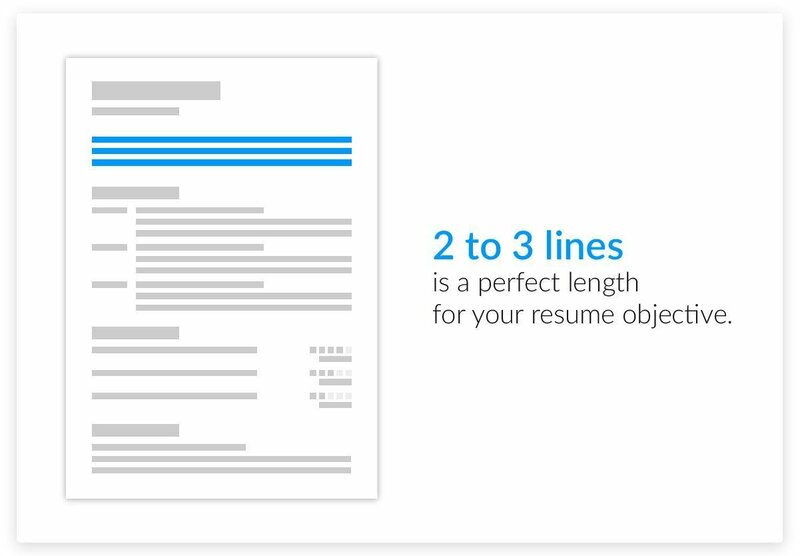 We’ll show you how to start a resume with a bang. Step by step. You’ll soon be well on the way to writing the perfect job-winning resume. How to start a resume with a bang that makes hiring you the recruiter’s priority.. Samples of the best resume sentence starters to get the hiring managers hooked. Best way to start a resume with no job experience (or with just a little). How to start writing a resume that ends up better than the competition’s. Here's a sample resume for an IT specialist made using our resume builder. 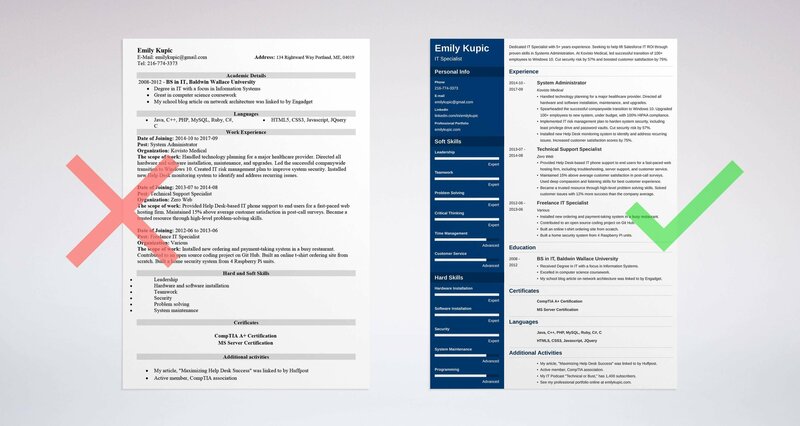 Resume example with a strong start - See 20+ resume templates and create your resume here. So you want to start the resume with a bang that get’s the hiring manager on the phone. Or, perhaps you can’t figure out how to start writing the resume from scratch? Worry not; we’ll show you how to do both. See, the best resume opening is the heading statement. That’s what can get the recruiters hooked. But here’s the twist. To make most impact, that heading - the resume summary or objective - has to be the last thing you write. So let’s focus on how to start writing a resume in the first place. How to set up a resume? Before you start writing your resume, come back to the original job posting. Save it. Then, keep it open while writing your resume and cover letter. The job description and your experience decide whether you’ll use a resume objective or a resume summary (that section we moved to the end). The education section may benefit from specific coursework listed in the job ad. The job posting will determine which resume keywords will be important. It may have other information or instructions necessary to writing your resume and cover letter. Want more on why job ads are crucial for starting the resume writing process? Why keywords from the job description can help you get hired?? See 6 Tips on How to Tailor Your Resume to a Job Description and our list of Resume Keywords To Use. Pro Tip: Run the job description through a keyword finder tool such as Jobscan to help you find the employer’s most relevant keywords. Let me guess. You don’t know how to start writing a resume because you started by putting your contact information on the resume and immediately hit a brick wall. Here’s the second step you need to take before you even start writing your resume. Set up a resume outline first. It helps ensure you didn’t forget any key sections. It allows you to visualize how you’ll structure your resume. It strengthens the accuracy of your resume. A recruiter spends 6 seconds scanning each resume on average. So, a resume outline is crucial to provide the recruiter with everything they want to know about their perfect candidate - you. There’s one more step you might have to take before you start writing your resume - pick the right resume format. For most job seekers the reverse-chronological resume format works best. It’s a one-size-fits-all deal. It highlights your work history by starting with your last job and going backward from there. Some might benefit from using the combination resume format. It’s for people who want to show off their skills before jumping into their work experience. It’s a top resume format for career changers or high-level professionals. It’s also a good resume format for job seekers with employment gaps. If the resume itself were a meal, the work history in the experience section would be the main dish. Starting with your most recent job, you go back in reverse-chronological order from there. See that? Each sentence of this sample resume begins with a verb. Action words make for great resume sentence starters. Pro Tip: People often use this section just to itemize tasks they performed in each position, but these don’t say much to the employer. Add quantifiable achievements to your resume that will show them you’re the one, like in the above example. Remember to focus on responsibilities and achievements relevant to the job you’re applying for! Got Little or No Experience? If you have no work experience, you might be best off if you start with the education section. If you have little or no experience related to the job to which you are applying, then you’ll have to highlight the most relevant skills and achievements from past jobs or even go with the combination format mentioned before. Think the education section is there just to make your resume longer? Think again. Most hiring managers require knowledge of your education on a resume. Many job listings also include a minimum education requirement, as well. It’s a key part of resume preparation. So, don’t leave education off when deciding how to make the best resume. Still in college and working on your degree? No worries! If you need to know how to start a resume for a teenager or for high school students, style it the same way, but skip your high school if you have higher education to list. Pro Tip: Be careful! Listing your GPA is an optional choice, but if it’s too low, then it may hurt your job seeking chances instead of help! You’re off to a great start on your resume, so let’s keep that momentum going. Additional sections on your resume may vary, but they definitely help you to stand out from the other applicants. Additional sections may include volunteer experience, certifications, hobbies and interests, knowledge of languages, and more. Cover letters are where you get to take a much-needed break from all the technical speak and jargon and really let your human side shine. Want to know how to start a resume cover letter that will have them begging you for an interview? Check out our great cover letter tips or learn what to include in a cover letter. If you followed all the steps above, not only did you start writing a resume, you’re almost done with the whole thing! Now, time to finish writing the resume and give it a head start. The heading statement will be the first thing recruiters start reading. It is the first impression, the make-or-break area for a recruiter. The heading statement is an intro for a resume. It comes in the form of a resume summary or a resume objective. Choose the resume summary if you seek a position at a job in which you have experience. The resume summary summarizes your position-related skills and qualifications. Choose the resume objective if you have no job experience, or at least no experience related to the job you’re applying for. Instead, you’ll highlight transferable skills from other areas and make the case that though you don’t have experience with this position, you do have experience relevant to it. Now, we’ve come full circle, where the end of the article is all about the beginning of your resume. And, would you look at that! By learning how to start a resume with a bang, you’ve gone on and completed the entire thing. Pro Tip: Keep your opening statement on your resume down to no more than 3 or 4 lines of text and around 2 or 3 sentences. Hopefully, with these tips and advice for resume starters, you should be well on your way to finishing a resume you will be proud of. Preparing a resume - It might seem dreadful to add on more tasks at the beginning of a resume. However, starting a resume with an outline and choosing the proper format will make sure you do it right. Beginning statement - Knowing how to start a resume introduction is a make-or-break sort of deal. It gives the first impression, so you’ll want to craft one that will start with a bang and grab their attention. Experience & education - You understand how to make a resume experience and education section, so now you’ve laid the foundation for a strong resume that will surely get you interviews. Do you have any questions on how to start off a resume for a job? Need help with building your resume or with how to make a resume look good? Give us a shout in the comments below, and we will answer your question. Thanks for reading! Address on a Resume? 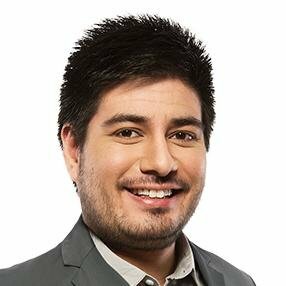 Social Media? What Contact Information to List. Should I put my address on my resume? In full? Learn what contact information to include in your resume: how to write up your phone number, how to put LinkedIn on a resume (or other social media), and how to pick a professional email address. Don't sabotage your job hunt, get help from this contact info guide!